Kenneth Lin, the CEO of Credit Karma recently e-mailed me about their site, which offers free credit-score tracking. 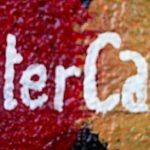 Credit Karma has actually been around for awhile, but I had never bothered signing up until Kenneth contacted me. I figured that it’s free, so what’s the harm in trying? Setting up an account was dead easy, but you should be aware that they’ll ask for some fairly sensitive information, including your social security number (SSN). This should come as no surprise, as they need this info to access your credit records, but I just wanted to forewarn you. The good news is that they never ask for a credit card number, so there’s nothing to cancel. Ever. Once I had confirmed my e-mail address, I was in. The actual “product” that Credit Karma delivers is pretty simple. It’s a three digit number designed to reflect your credit score (see below). As I understand it, this isn’t a “real” FICO score, but it is based on real information from your TransUnion credit report. They also recently changed their algorithm to make their scores more comparable to FICO scores. 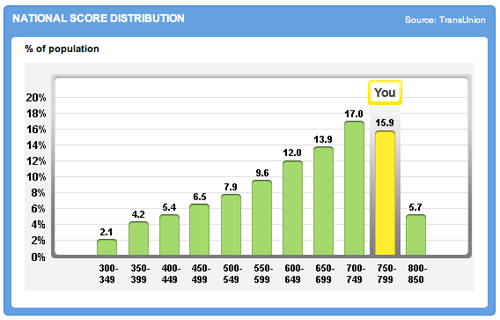 For the sake of comparison, I recently checked my FICO credit score via Equifax and learned that it’s 798. 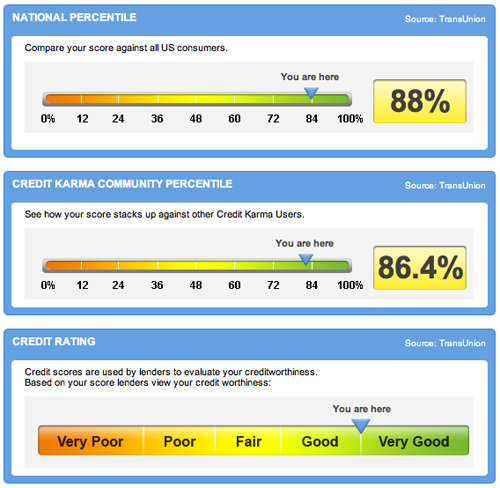 Two real strengths of Credit Karma are that they offer a plethora of statistics that let you know where you stand in a relative sense (see below), and they allow you to track your score over time such that you can see trends, and perhaps spot anomalies that might be signal negative information on your credit report. Oh, and one more thing… They’re free. There’s not much to say here. 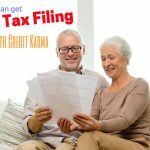 The biggest downside of this service is that, as I mentioned above, they’re not providing you with a “real” FICO score, but rather a reasonable facsimile of one, but… As I also noted above, this is still a very useful tool for tracking trends and figuring out where you stand relative to others. The other point is that the site is fairly ad-intensive. That’s understandable, however, as they’re offering this service for free, and they need to make a buck somehow. The good news here is that the ads don’t reduce the usability of the site. Indeed, it’s still very easy to find everything that you need. If you’d rather get your real credit score, and you don’t mind having to call back to cancel before you get charged, then you should check out TrueCredit or MyFICO. Both offer 30-day free trials that give you access to your credit reports and your credit score. See also my earlier article on how to get your credit report for free. But, if you don’t want any headaches, Credit Karma is definitely worth a look. On the whole it’s a decent service. I’m using it to track my parent’s credit scores during their personal health-related credit crisis. It was definitely more useful than some of the credit-score “calculators” I had used such as at Bankrate.com. I was disappointed that it didn’t have more personalized advice (at least at this time). I wish their credit “simulator” had some more options (and was more AJAXy, so the whole page didn’t redraw). Perhaps if the simulator worked in reverse, like a “what’s the single best thing I can do to improve my credit?” button. I also wish that the offers could be broken out to just e.g. credit cards, instead of “Financial” which apparently includes Quicken Online. I will say that the score my dad got was not high enough to get offers for anything other than “starter” cards, so my view of the offers may be skewed by that. I just went for mine, and it was a couple points lower than what it was a few weeks back. Definitely a good free tool to use. This is fantastic. Although I think that one can spend too much time obsessing over credit scores – if you pay your bills and handle your money well, your score should be just fine. However, it is great to have a free resource to keep an eye on things. I am going to be doing some serious credit score building starting this January with the new year. I’m glad that I ran across this, because I think that the analysis is a really good tool to have, in lue of just having your score. Thanks for showing the difference between your CK score and your real score. When I got mine from them a couple of weeks ago, I thought it was 20-40 points below where it should be. So seeing the 20pt variation in yours (which, curiously, is within 1 point of mine) along with the explanation was very helpful. What a great tool! I love the graphical data. Anything that will track my credit vs other’s credits, etc… is a lot of fun! I think I’ll take a look at it. Thanks for the post.